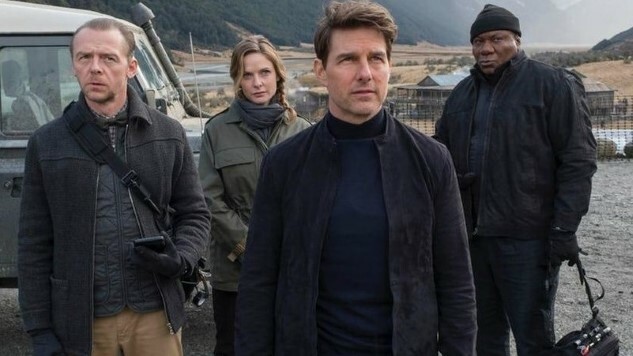 It seems safe to say that at this point, the most impossible of all missions would be attempting to keep all of the various Mission: Impossible film plots separate in your head. Keeping in mind that seemingly every one since the 1996 original has featured super-spy Ethan Hunt (Tom Cruise) “going rogue” and being hunted by his former friends and enemies while “racing to prevent a global catastrophe,” you’d be forgive if the entire series had blurred together into a single pastiche of running and explosions in your mind. At this point, it’s almost easier to categorize the film by Cruise’s signature risky stunts than it is by any of the other events that actually happen on screen. Wait, you’re SURE that’s not the same synopsis as the previous film, right? Alec Baldwin: Accept it, Ethan. You’ve lost this one. What’s done is done. Tom Cruise: What’s done is done when we say it’s done. Uhhhhhh … can those words actually be strung together in that order? Is Ethan Hunt turning into Yogi Berra in his old age? Cruise is 55, by the way. So. Will Fallout be the final Mission: Impossible? As much as it pains me to say, it doesn’t seem like it. If this was going to be the final entry, surely it would have a title that implied as much, in the interest of picking the bones clean of every potential dollar there is to be made. SO: Prepare yourself for Mission: Impossible – Apocalypse a few years down the line.